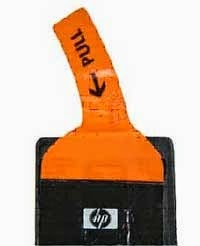 Finish the error 0xc19a0013 youself, no need go with you printer to tecnical support. Printers that show these errors, often have hp 564, 178, 862, 364 or 920 ink cartridges. If that is your case, you are in the right post. When these errors appear, what they want to indicate is that there are problems with the ink system. It is not precisely about the external ink system but about the ink system that is the printing process of an HP printer of this type. The ink system consists of the ink cartridges and the head of the printer. The head of this printer is not attached to the ink cartridges, it is an aside tool that processes ink as a conventional cartridge does. When these cases occur there is the possibility of that the ink cartridge is exhausted or the ink cartridges are exhausted. It is important to know that the ink cartridges should not be out of the printer for long time since their ink outlet could get dried, it is recommended to use the protector label provided by the manufacturer for their well-functioning. If the cartridge still has ink but it is not printing, the 920HP cartridges can always be verified since the protective label has been perfectly removed which is where air enters the ink cartridges. See image below about the good and the bad way to remove it. 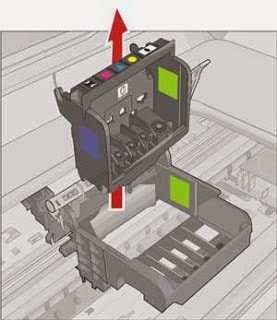 Just as it is shown in the image, the most advisable is to move it to one end so it comes out completely, this way it is avoided to leave pieces obstructing the air flow that allows the ink cartridges to print well, avoid as well tearing the label indicating the cartridge number. To place the 920, 564, 178, 862, 364 HP cartridges it is needed to take into account to place them in their corresponding color; it is important that each cartridge color is not confused, although it does not fit but just place the cartridge where the color is indicated, if the cartridge does not come in correctly, do not continue. If the error persists, try with the second potential solution for this error then. Turn the printer on. Press the ON/OFF button. Once the printer is on, unplugged the printer from the power supply; it is clearly stated that unplugging the printer while being on is not an inadequate process but if there is any problem with the electricity causing this error, it will disappear. Be careful with the electricity. If the error persists, try by cleaning the heads of the printer. To clean the heads of this printer it is needed to be extra careful since they are really delicated and complicates, it is recommended to follow the procedure as shown below to avoid worst damagesto the printer and its head. 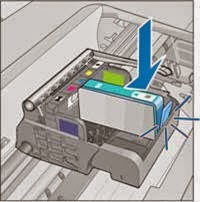 This process should be perform after taking out the ink cartridges as shown in the image, the ink head cannot have cartridges to be able to take it out of the printer, perform the entire process with care so you avoid the head. 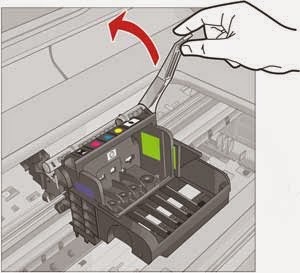 In the image above it was shown the places that must be cleaned so the ink head cleaning to be satisfactory in 920, 564, 178, 862, 364 cartridges. Do not touch with the hands the electrical connectors of the heads; this could leave signals that disrupt the correct reading of the connectors and then errors when printing. Also, the printer connectors can be cleaned, those as well can contain ink or any other obstruction which does not allow the proper electric contact of the printer, and therefore errors appear. See image below. What comes next is to place the head of the cartridges properly; it has to be done steadily and carefully to avoid any slack in the cartridge placement since this can cause errors to show. Last solution, after trying all before procedures, is to change the heads of the cartridges. Thus, before buying a new one, get in contact with the HP client support service by clicking on the following link, if the head or the printer are still in warranty time, they will replace it with another; otherwise, buy one. To get in contact with HP client support service visit the following link Hp Support for warranty verification in Spanish printers.